One of Western Watersheds Project’s lesser known but essential efforts is working with high-school and college students to provide on-site educational experiences about the degradation of public lands in the West by domestic livestock. 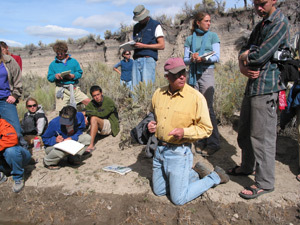 Every other year in the fall for the past seven years I have participated in a seminar in Elko County, Nevada, with students from Whitman College in Walla Walla, Wash. In late September or early October I meet with 25 to 35 students near Jackpot, Nevada, to discuss immediate and long­term negative impacts of livestock grazing on the Trout Creek watershed in Elko County. 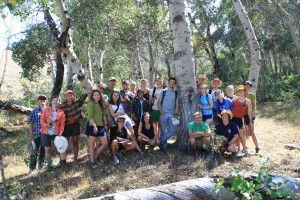 The Whitman College program is called “Semester in the West.” (See their interesting web site at: http://www.semesterinthewest.org.) The program is organized and directed by Professor Phil Brick, head of the Department of Politics at Whitman. Brick specializes in the politics of public lands and has edited highly regarded books on the subject including “A Wolf in the Garden: The Land Rights Movement and the New Environmental Debate” (co-edited with R. McGreggor Cawley) and “Across the Great Divide: Explorations in Collaborative Conservation in the American West,” co-edited with Donald Snow and Sarah Van de Wetering. His comprehensive program of education about the West involves a full three months of travel and camping with his students. During the semester Brick’s class meets with dozens of people who are involved with current and often contentious issues of public lands management and land tenure as well as wildlife management and the Endangered Species Act. The Whitman students are a remarkably open minded and interested group, eager to ask questions and share ideas about what they are experiencing. I have enjoyed each year’s outing with them, even when what we discover on the ground in the form of denuded, devastated public lands is alarming and unconscionable. The degradation of Trout Creek and its tributary watersheds is one of many disturbing examples. The discussions and questions from more than 100 students were thoughtful and encouraging. WWP staff and I prepared a quiz for students in each of the classes, and the winners received one of three prizes: a WWP T shirt, a video about grazing in the Southwest and a poster of the book cover to “Welfare Ranching: The Subsidized Destruction of the American West.” I have also presented a copy of the book to environmental science teacher Darin Zarbnisky, who kindly invited me to speak to his classes.